What do you do in Sixth Form? Settle College were proud to participate in the Tour de Yorkshire Trophy tour. 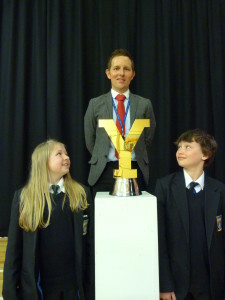 Pictured with the trophy are Charlotte Booth, Harris Dinsdale and Assistant Principal Mr Whitaker. The school's curriculum is aspirational and inclusive. Pupils enjoy the challenge of academic rigour.